The Interactive video content type allows you to add interactions on top of video clips. Interactions such as images, elaborating text, links and quizzes pop up while the learner watches the video. Interactive videos are perfect when you already have a video clip that you want to enrich with interactive elements. You can facilitate differentiated learning by adding in-depth information such as pictures, tables, text and links that the learner can interact with during video playback. Include puzzles for the learners to solve at any given time in the video by adding Multichoice questions, Fill in the blanks, Drag and drop questions and Summaries. Navigate to the menu that enables you to create new content. In Drupal, you select Interactive content. In WordPress you press Add new under H5P Content in the admin menu. In WordPress you select H5P Content and Add new from the admin menu. Select the Create option for H5P. If you find Interactive video in the list of Content types, skip to Step 1. 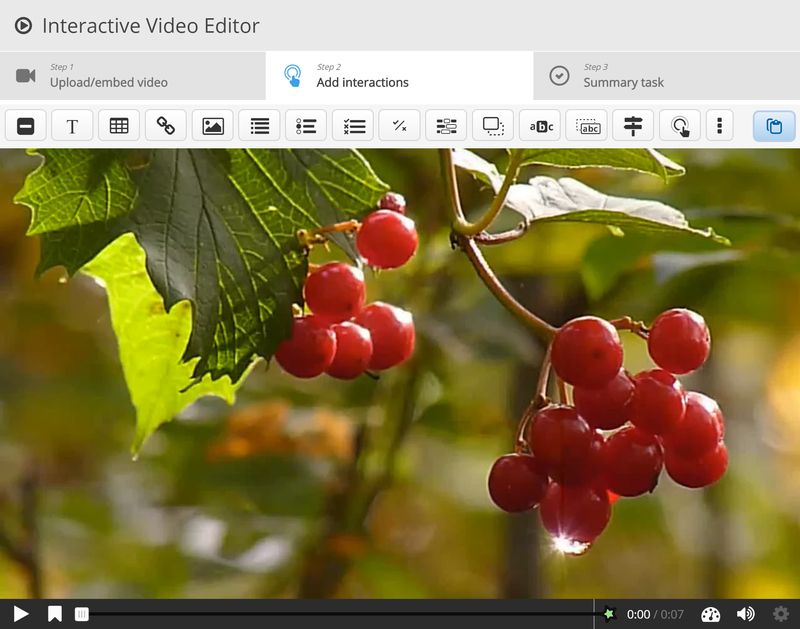 You will now find Interactive video in the Content type list when creating a new H5P. We'll use a very short video of redcurrants as a basis for this tutorial. 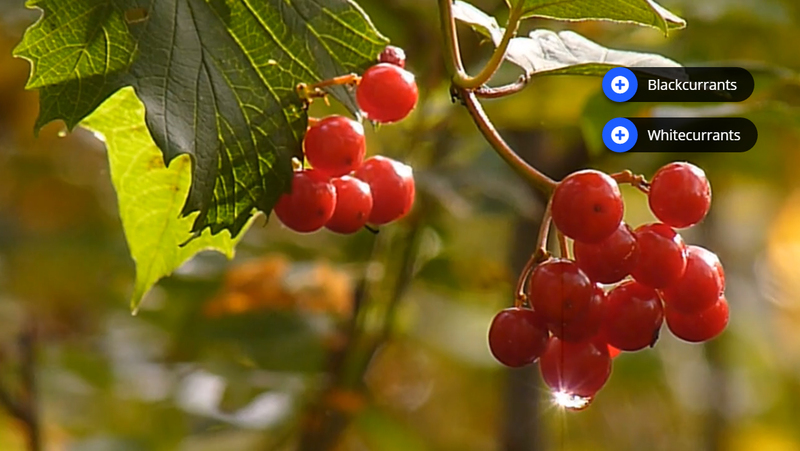 -> Berries from Fred Rune Rahm on Vimeo. A video clip is the cornerstone of any Interactive video. The .mp4 video format will work in most browsers. However, you should provide an alternative video in webm format just to be sure. Opera browsers, for instance, does not support the .mp4 format at all. You can check which browsers support the .mp4 video format here. In order to convert the mp4 video to a webm format, you can use an open-source converter such as Miro. Head over to where you usually create new content on your platform. In Drupal you go to Create content and select Interactive content. In WordPress you select H5P Content and Add new from the admin menu. Then select the Create option for H5P and choose Interactive video from the list of Content types. In this tutorial, we'll focus on creating the interactive elements in the video. Therefore, we'll focus on the top part of the editor, above the Common fields header. The Interactive video content type consists of three tabs: Upload video, Add interactions and Summary task. These three steps represent a natural workflow for creating an Interactive video. By default, the Upload video tab is displayed when you create a new Interactive video, and this is what you always want to start off with. Here's where we add the video clips that our Interactive video is based on. 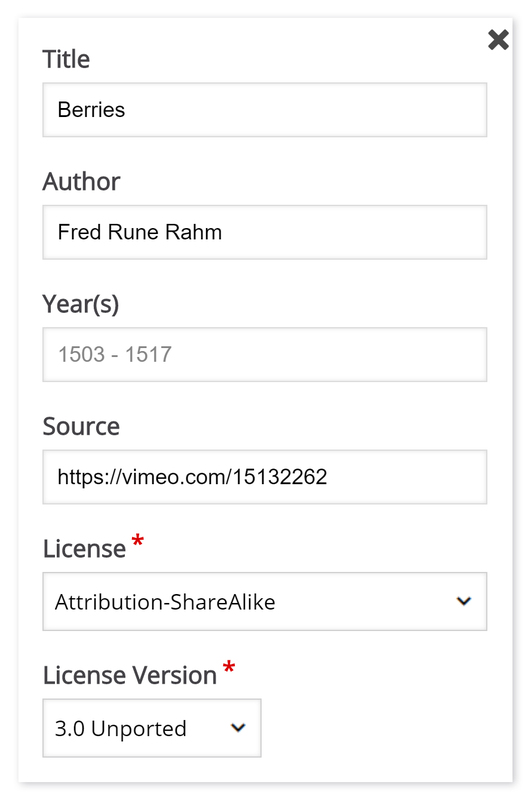 Since we are using a Creative Commons licensed video clip, we add the information below in the Edit copyright dialog. Now that we've added our video files and copyright information, we're ready to add interactions. In this tutorial, we'll add a Text and an Image interaction. We'll add a short text about Redcurrants which the learner can choose to read. First, add a Text interaction by pressing the Text button on the toolbar, then drag it on top of the video and drop it in the middle of the video. A dialog will appear when you drop the interaction. We want the text interaction to be visible in the first three seconds of the video. Type in 0:00 as start time and 0:03 as end time in the Display time field. In this case, we don't want the video to stop automatically when the interaction appears, so we'll leave the Pause checkbox unchecked. The Label is a text that will be displayed next to the interaction icon as a short description of what the learner can expect to find in the interaction. Type Redcurrants in the label field. Redcurrants are the bright red translucent edible berries of the Ribes rubrum shrub, which is native to western Europe. Play the video to make sure the interaction is visible at the correct time. Double-press on interaction icons to edit interactive elements. We'll add two image interactions showing other types of currants which the learner can view by pressing on the image icons. You can add an Image interaction in the same way we added the text interaction. Press the Image button, drag it onto the video and drop it where we want it to be placed. In the first Image interaction we add the blackcurrant picture. In the Display time field, insert 0:03 - 0:03. This time we'll check the Pause checkbox, so that the video pauses when the interaction appears. Add the Label Blackcurrants. Also use Blackcurrants for the Alternative text and Hover text fields. Press Done. Remember to add appropriate license information when using multimedia you don't own the rights to. You can also add Multichoice questions, Fill in the blanks, Drag and drop questions and Summaries in Interactive videos. You add and place them in the same way as the Text and Image interactions. Please read the individual tutorials for these content types to learn more about creating them. At the end of an Interactive video, you can add a Summary. The Summary is intended to make the learner reflect on the learning content presented in the video. We'll add two statement groups in the Summary. 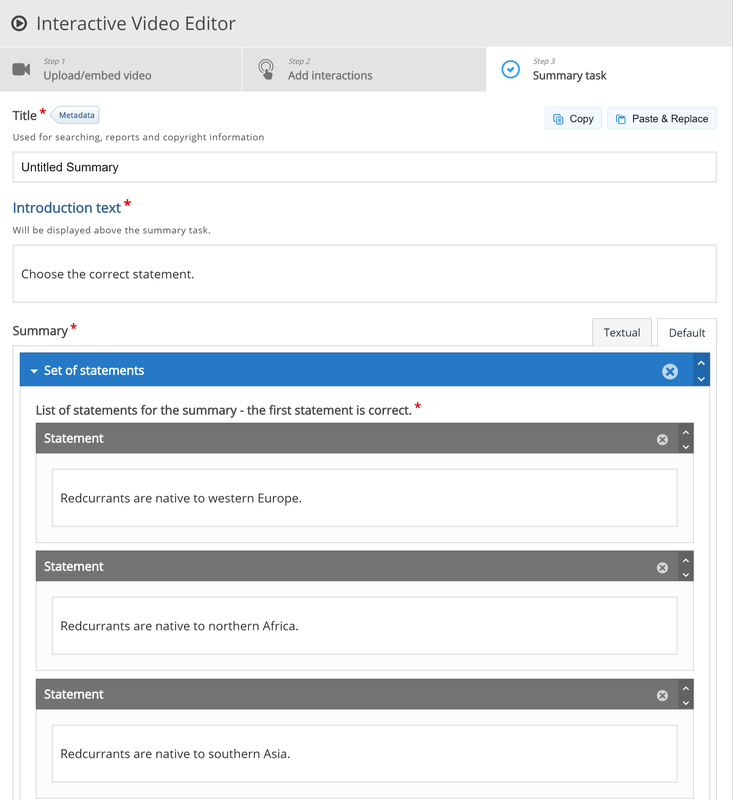 For a detailed description of how to create Summaries, you can read this tutorial. Redcurrants are native to western Europe. Redcurrants are native to northern Africa. Redcurrants are native to southern Asia. Other currants include Blackcurrants and Whitecurrants. Other currants include Bluecurrants and Yellowcurrants. Other currants include Greencurrants and Orangecurrants. The first statement is the correct one here as well. Although the example video we're using here is very short, we'll add a few bookmarks. Bookmarks are used to indicate a new topic, an important interaction or an event within the video. Head back to the Add interactions step by pressing this tab in the top of the editor. You add a bookmark by moving the playhead to a desired point in the video and pressing the Bookmark button. We'll add a bookmark where each interaction appears in the video. Move the playhead to 0:00 and press the Bookmark button. Add the label Redcurrants to the bookmark and press Enter on the keyboard. Move the playhead to 0:03, add a bookmark and label it Other currants. Finally, move the playhead to 0:04 and add a bookmark labeled Summary. Each bookmark is indicated with a vertical grey line on the seekbar. 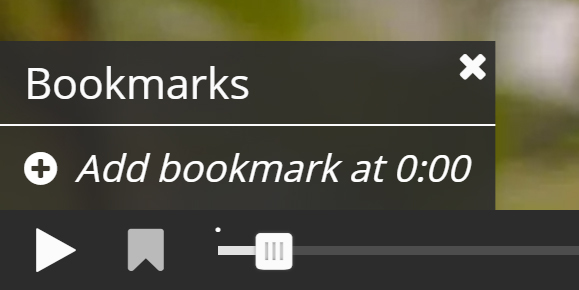 Learners can jump directly to a chapter by pressing the bookmarks in the bookmarks menu. You can edit a bookmark label by moving the playhead so that the bookmark you want to edit is displayed, place the cursor in the bookmark text and edit the text directly. You delete a bookmark by pressing the button to the right of the bookmark label. Save the node/article to view your finished Interactive video. You should now have the same result as the example referred to on top of the page. We have only scratched the surface of what's possible with Interactive videos in this tutorial. If you have any questions, or think something is missing from the tutorial, feel free to leave comments and suggestions. I have installed the plugin on my home page and when I make a new post with an interactive video , the post is showing void how can I show my video ? Could you provide a link? 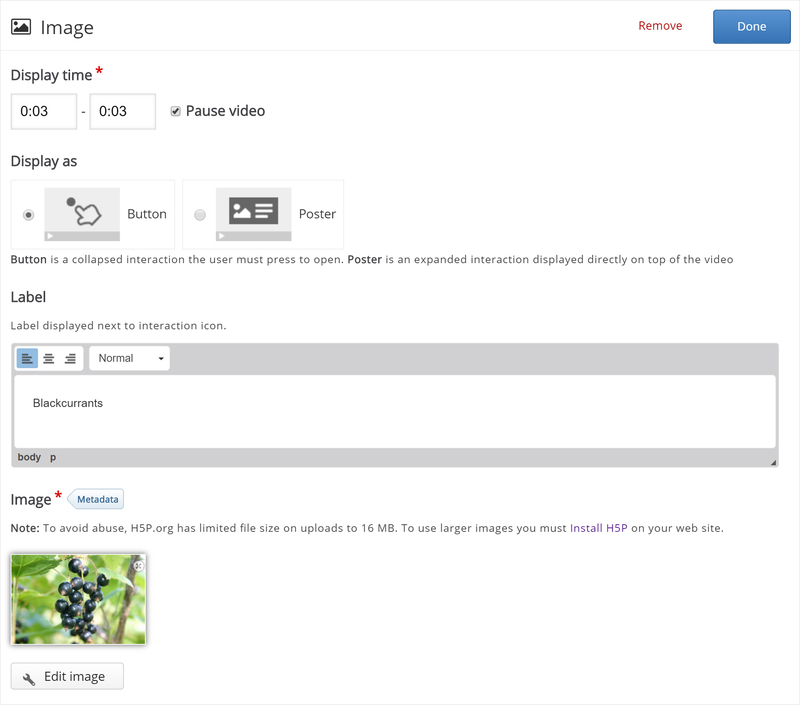 Are you able to make the video appear on your admin dashboard? Is anyone having any idea? I tried http://h5p.org/node/735 with Firefox 38.0.5 on Mac with no problem, but we just upgraded H5P.org. Do you still have this problem? Now it works perfectly. Thanks! Hello, first of all very thanks for your valuable tool, I have a question : there is a way to pause the videos automatically when they arrive at a chosen time? hi =- the new branching narrative features works very well. However, I've feedback from staff that they are not finding it because the 'signpost' icon you have for it has the title "Click and drag to place go to question" which doesn't make sense. i.e. its not great english. Could it be changed to either "Click and drag to add branching narrative" of "Click and drag to add question based 'Time jump' " or something like that. I'm leaning towards branching narrative or crossroad. Branching narrative might be a bit too sophisticated? Crossroad also has a second meaning that works well in a dilemma context so I kind of like it. What do you think? Anybody know which is the maximum video-limit size? I tried to upload 32 mb without success. On H5P.org the limit is now 16 MB. You may use YouTube or host your video externally in some other way to be able to use larger videos. Thank you for you answer!! Is there a way to make the text box transparent? That is not supported natively for text in interactive video, however there are ways to add it. Getting "Enable to decode media"
It looks like your browser is having issues playing the video. You could try opening the video directly in your browser to see if it works. It could also be related to something with your web server setup/configuration. to continue the video after a correct answer I have to fill in a go to-time M:SS minimum a second later than the end of the display time M:SS so that a pice of information of the video is lost. If I take the same time I´m caugt in the loop. Ist there a solution that I don`t see? Are you using the adaptivity functionality or the Go To Question? Hi, I am using the Go to Question funktion of the video editor. It is the plugin for Wordpress. I see you are correct. If your Go To Question is displayed at 1:00 (display time: 1:00 - 1:00, pause: on) in a video, you need to goto 1:01 to not get into a loop. I.e, one second is lost. It would be great if you could add this as an issue on the relevant GitHub repo. At this point, I think this issue would need funding to be implemented since no-one has mentioned this problem before. Another option is that someone in the community implements this when seeing the issue in github! is it possible to create moving interaction point? For example, an interaction point that during a video follows a subject? Most of the content modules work on mobile, but this one (Interactive Video) does not seem to show up at all on mobile. Is this a known issue? Interactive Video should work well on Android. Are you using iPhone ? There is an issue for adding supports for iPhone in the next release. Yes, I was using Iphone. That's great news regarding the support in the next release. I am still having trouble seeing this on iphone. it always goes to full video mode and i lose ability to see interactive controls. Any thoughts? Which iOS version are you on? Hi, how could I Hide seeker for interactive video player without touching library H5P core. Each question that has a score within interactive video sends an xAPI event when they are completed. You can catch these xAPI events using the method explained in the H5P and xAPI guide. There is no way of doing that right now out of the box. You would have to implement a specific library hook for this. These can be implemented by reading the respective guides for drupal and wordpress. Is there a way to add captions to the video? Great! I am amazed by how you respond to queries and the how you look at improving the app to enrich student experience! Thank you. Hi again, Timothy. I went over the video improvements and I found that yes, the question in the example was open ended but there were choices for the answers. I was wondering if an open ended question can be answered but about 3 - 5 sentences. In this case, the instructor will have to mark the responses manually and enter the grades manually as well. The questionnaire content type is built up of pages. On these pages you can add either a multiple choice, where you will select a pre-defined alternative, or an open ended question, where you will write in free text in response to a question. The open ended question has the alternative of setting how many lines that the answer will be: 1,2,3,5 or 10 lines. Is this sufficient for your use case ? 3. Added an interaction, (Tab 2) among the choices in the top bar, I selected multiple choice or should it be a single choice set? I did not find a choice for an open ended question . Even for content types alone, did not find Questionnaire among the choices. Were we able to install the full version of the app? Is there an alternative? I am building a Moodle shell for online instructors to help them create more engaging activities for the students. Just make sure you have the latest version of the Content Type, and you should have access to this. Questionnaire should be the right most option, on the toolbar, inside interaction. "Enable LRS dependent content types"
Be aware that you need an LRS (learning record store) or a similar way of grabbing external events in order to store the actual answers submitted through the Questionnaire, so that you can review them at a later point. Hi, Can we ensure that the video cannot be forwarded without attending to the interactivities? This will ensure that the student completes the entire video. Hi, A new feature for preventing skipping in Interactive Video will be released in the upcoming release! However there is no way to enforce a user to actually attend the interactivities at the moment.